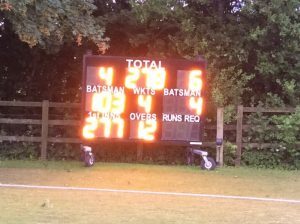 A new fixture is always good news, but to play the Hampshire Hogs on their beautiful ground at Warnford was very special. Arranged between the Club’s respective Presidents over the winter, this is the sort of cricket the Refreshers enjoy most – good, competitive and very much within the Spirit of Cricket. On a warm but overcast day we lost the toss and took the field. Leo Buscombe and Oli Kavanagh shared the new ball and bowled pretty well for the first hour. After two hours of mixed seam and spin (the latter from the Mohindru brothers), we had restricted the Hogs to 160 for 2 at lunch – a solid score but one achieved on a dream batting wicket and a lightening quick outfield. We had fielded well and were content with progress at that stage. After lunch however, while the Hogs may have thought they would rattle along to about 375 before a declaration, Leo and Oli, both brought back, had other ideas and started getting amongst the wickets. Both bowled quickly and straight, racking up 37 overs between them. Again, we fielded well, and Tom Dumont was keeping out of his skin – one of his three catches is already a contender for magic moment of the year, as he dived full length down the leg side to scoop up an inside edge just inches from the ground – superb catch. So the Hogs ended up with 277 all out; if we were to win the game someone was going to have to bat well. They did – nearly everyone making meaty contributions. Dumont, irrepressible as ever and instructed to take a look before doing anything silly, hit the first delivery over midwicket for 4. Anu was bowled by a quicker one whereupon Abhi Mohindru joined Tom to put on more than 100 together – Tom eventually fell for 53 and Abhi annoyed himself hugely by getting out for 77. In the meantime, Leo Buscombe had come in at 4, and launched into an exhilarating demonstration of batting class as we powered towards our ever more achievable target. Sam Burrett replaced Abhi and rattled up a quick-fire 31 as the gap closed and by the time new recruit Rob Tatton-Brown joined Leo it was all over. Leo got his ton with the final scoring shot of the day to finish with a fabulous 103*. This was an assured Refreshers victory and a most enjoyable day’s cricket. 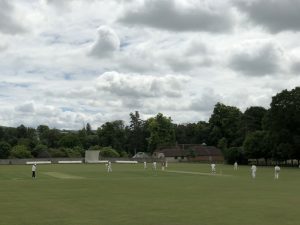 We were most grateful to the Hogs (and the Grants, pere and fils) for putting on an excellent day with a splendid lunch and tea, and drinks in the pavilion bar after the game. A perfect Saturday.